By railroadlawyer in Railroad Crossing Accidents on January 26, 2016 . Police stated this week that a woman from Arlington Heights IL was killed when her SUV was struck by a commuter train. The driver was going southeast on Northwest Highway and was crossing railroad tracks when she was hit by a Union Pacific Northwest train at Euclid Avenue. the SUV caught fire after the crash and was pushed by the train for several blocks. No one else was injured in the crash. Our Virginia railroad accident law firm has seen many needless deaths occur at railroad crossings over the years. One of the common problems at railroad crossings is that trees, shrubs and vegetation are not properly maintained and this can lead to obstruction of sight lines. Our Virginia rail crossing law firm uses retired railroad employees as investigators in incidents such as they above. In this sort of case, we would send investigators to the scene of the crossing. We often represent clients who were hit at a railroad crossing and often can prove that appropriate safety measures were not followed at the railroad crossing. For example, in one Virginia railroad crossing accident, we sent investigators to the crossing and carefully examined the trees, vegetation and brush around the area. 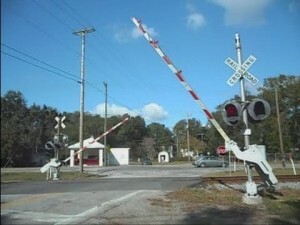 Our client stated that he could not see the train at the crossing until the very last moment. Our railroad accident team studied Virginia common law as well as potential jury instructions and various other circumstances, and made a demand for settlement from the man’s insurance company and also Norfolk Southern. This resulted in a settlement amount in excess of $100,000.